Concealed Depression: What Does Depression Really Look Like? Thankfully, talking about depression is becoming more socially acceptable. There appears to be less stigma and people are being made aware of the signs. People are beginning to express their feelings of depression. There are 350 million people today, who suffer from depression, according to the World Health Organization. Many continue to suffer in silence. That’s approximately 1 in 5 people. Think about that. If you are in a room with 20 people, there are four people suffering with depression. That’s crazy! So, why don’t we see it? Why don’t we see all the systems loud and clear? Well, because some of those who suffer with chronic depression have learned to conceal it. 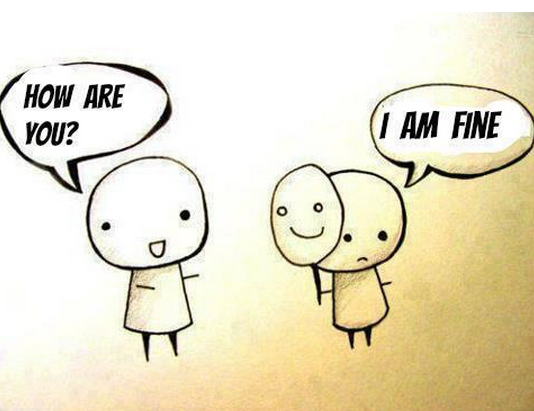 They put a mask on and hide behind a smile. There was a really great article on Huffington Post called 11 Habits of People with Concealed Depression. I love how the author used the term “concealed depression”. That’s exactly what it is…concealing your inner feelings from the outside world. The more we open up and talk about it, the more likely the ones who suffer with concealed depression will find the courage to ask for help. I am almost not surprised anymore. The number of people, who you would never guess, suffer with depression. They hide it so well, that to the outside world they seem confident, friendly and upbeat. I remember for years I’d be able to “hold it together” or “buck up” and I’d be able to keep a smile on my face. But once in a while, you get a glimpse of what’s really going on inside. It can be very dark. It might be a few words spoken, or a look in your friends eye. Be sensitive when those situations arise and show love. It could mean the difference between the person suffering in silence, or finally getting the help they need. Many celebrities, politicians, church leaders and musicians deal with mental illness. Some hide behind their fame so people do not see the “real” person inside. Too often their silent suffering ends in tragedy. Let’s make it okay for everyone to talk. Do you suspect someone you know may suffer from concealed depression? Reach out to them. Love them. Respect them. Give them a safe space to share. It could mean the difference between life or death.